MKUDDE Distance B.Ed. Programme at Madurai Kamaraj University, Madurai: Madurai Kamaraj University, Madurai has given Distance B.Ed admission notification 2019 and University invites applications from the eligible candidates for admission into its B.Ed. Programme in distance mode for the academic year 2019. 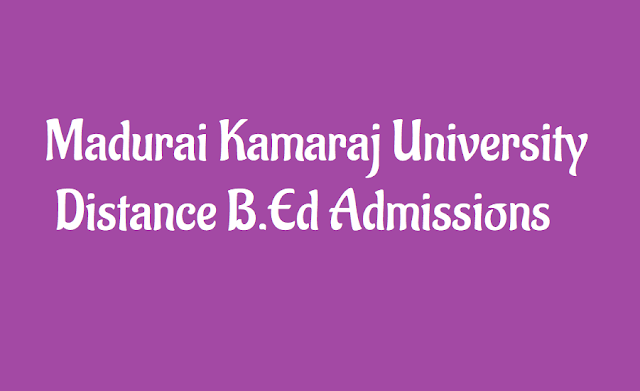 MADURAI KAMARAJ UNIVERSITY: Madurai Kamaraj University, is on its relentless journey for the past 48 years surmounting hurdles of indigenous and exotic nature on its way and has passed through the tests of accreditation towards reaching the status of excellence. University is aware that the process of achieving excellence is continuous and therefore, all efforts are in progress to keep up the momentum. The Bachelor of Education (B.Ed.) Programme of Directorate of Distance Education, Madurai Kamaraj University, aims at developing knowledge attitude and skills required by practicing teachers for effective teaching-learning process at the secondary level. The programme provides opportunities of sharing experiences gained by practicing teachers. It enables in-service teachers to select and organize learning experiences according to the requirement of learners. In addition, it provides knowledge and develops in them an understanding of areas such as educational evaluation, school management. DURATION: The duration of the programme is two years. A student has to complete his/her programme within 5 years. MEDIUM AND MODE OF INSTRUCTION: The medium of Instruction is English. However, the student teachers are allowed to prepare their assignments, practical records and the term end examinations either English or Tamil. II. Candidates who have completed a NCTE recognized teacher education programme through face-to-face mode. III. The school teachers with UG degree in the following subjects: Tamil, B.Litt., English, Mathematics, Applied Mathematics, Physics, Geo-Physics, Bio-Physics, Electronics, Chemistry, Bio-Chemistry, Applied Chemistry, Botany, Environmental Science, Bio-Technology, Plant Biology, Zoology, Micro-Biology, History, Geography, Applied Geography, Computer Science, Computer Application and Information Technology. The school teachers with PG degree in Home Science, Economics and Commerce with same UG degree. IV. The candidates should have undergone 11+1+3 or 10+2*+3 pattern of study. V. The candidates who have passed part III under Triple Major System in UG Degree are eligible to take one of the three subjects only as optional II. The aggregate marks of all the three subjects will be considered for admission. VI. The candidates who have qualified in PG Degree (5 Years Integrated Course) under 10+2+5 pattern of study are eligible. VII. Candidates should be currently working in schools (Primary / Middle / High School / Higher Secondary / Matriculation) in Tamil Nadu recognized by State / Central Government. VIII. Candidates having a direct UG degree (without +2 qualifications) / Direct Post-Graduate degree (without +2 and UG degree) are not eligible. IX. Candidates who have passed under Double Degree / Additional Degree Programme with less than three years duration are not eligible for admission. X. Those who are working in Colleges / ITI’s / Polytechnics are not eligible. The candidate is requested to submit the following photo copies of documents duly attested by a Gazetted Officer. 9. Ex-Servicemen / Wards of Ex-Servicemen Certificate. The last date for the receipt of filled in application form in the office of the Director, DDE, Madurai is .....2019.